genesisx, fanovorc and 6 Guests are viewing this topic. May I know if cerakote is applicable on plastic? I am in for this as long as I can buy a PCB at the time of the GB. Yea like I said I'm not particularly concerned when it comes to this design in particular - having the okay from the creator is for sure the most important thing, I just figured a word of caution may apply regardless because like I wrote in the last paragraph, being a prospect GB/community effort it has to sit well with everyone not just with Sam. who are the others in the community that should have an opportunity to speak their disapproval/uneasiness? Let's ask anyone with over 5000 posts. At least one of you is self aware. Please take notice of the poll added to the top of the thread. can you explain how the male end gets stuck outside the female end? The more I look at it, the more I see that white a some sort of ceramic version of the Alice and I love it! hmm Lubrigante rumored to be much cheaper, and half plate. My Lubrigante case from Ponoko cost about $60, and they have a $20 off coupon for first time users. I got a black acrylic with a Gold mirror on one side. It's the best $40 I've spent all year. I'm also doing a case from Pololu - a company in Las Vegas, which is not Poloko - although the name is very close. They made me an acrylic board where the middle layers are clear but the top and bottom are brushed aluminum for a more premium look. That case cost $93.00, and for a couple more bucks you can do some really nice engraving. Next I'm having a Sculpteo case made from Okoumé plywood. The size of their sheets is giving me some issues. If I can get it to fit on 1, its $60, and if I need 2 it will be $120. Which is probably too much for a "fake wood alice". I'm planning on posting pics, and sound tests comparisons for everyone when my PCB and plate arrive. Can you post pics of the lubrigante? And were there any weird things you had to do, or just fill out to forms and provide the DXF? Just curious what are the pros/cons of using UHMW vs nylon? didn't some nylon bottom pieces for the M65-A have warping issues during storage (in warm environments)? Yeah nylon is notorious for not handling humidity really well. My nylon M65-A bottom piece arrived warped but once assembled with the alu top piece, it's straight as an arrow. And one of the cool things about this community is the maker aspect. This IC offers something different though imo. I'm not just trying to make a budget Alice. If budget is what you're going for, the files have been open source for a long time, and the Lubrigante is proven to work now. This is a new material that I think will excel in areas I think are important: sound, feel, durability. I don't want people to be confused, though, about what this IC is for. If you post pics of the other builds based off the Alice files, please clearly label them as what they are in the post itself. I appreciate it. seems like a far cry but will a wrist rest be possibly offered? I won't even get the prototypes in a week. However, this is definitely going to GB. I just value the IC phase, especially with a new material like this. For the Lubrigante, you're getting an Alice layout keyboard in an acrylic case for a good price. I wouldn't try to choose between the two if I were you. If you can swing it financially, go ahead and get in on the Lubrigante while you can. This kit will also be available and offer a different feel, look and durability if that's what you're after. For sure, thanks for the speedy replies. Definitely want this one since it’s going to be a more solid board. Is there a limit to the GB? They have a specific air dry formula for using on plastics..I think its not made specifically for plastic, but Im currently talking with a gun company and the guy says he can cerakote my Dolch pac keyboard case.. I'm optimistic and want to say "no limit," but this is also my first GB. Other, more experienced people, might have advice as to why I should limit it. eat the cost of anyone that backs out, and I can't afford that. But optimistically, exactly as many people that want one can have one. And then I'll have extras for late-comers. Right, so the person I talked to specifically said it is proven with ABS, and UHMW has similar heat tolerances to ABS. Both are right at the lower limit, though, of what is possible with Cerakote. Will this be branded as tgr just with a different material? Using the same manufacturer as thr original and etc. Or will this be branded as something else? It's not my original design. Putting a name on it to me is disingenuous. Someone new to the scene might think I came up with it, when all I did was try to recreate one for myself from the original designer's open source files. Yuktsi gave the go ahead to share it with others, but it doesn't have his magic spit on it, so I can't put TGR on it. Also, I don't usually like branding, but the TGR logo is pretty darn nice. I've tried to come with something that aesthetic, but to no avail. I could as a joke put a vector outline of a crayon'd attempt at the logo, signifying my childish attempt to recreate the original for myself. But I actually think the board will be far from a plastic toy. I hope it to be a tank you can beat up for years and years and still enjoy. Other cheaper options are great for what they are. But I wouldn't put it in a soft bag and take it to work everyday. Already have a PCB but not the plate, so would be great if there is an option to buy the case and the plate, but not the PCB. I'm interested, hopefully it's no more than $350 for the case, plate and PCB though. Is there any chance of a completely clear case? Raw UHMW is the white from the video in the op. So clear is not possible. And just hfor clarification, black is black all the way through, not painted or surface treatment. I hope to get the prototypes in before the end of the month, but i have no hard date yet. A couple I can hand deliver for feedback. The PCB is produced by projectkeyboard. I was impressed with the plate I got from the GB, and I'm looking forward to this PCB. Please give me feedback for color or design options for the PCB. 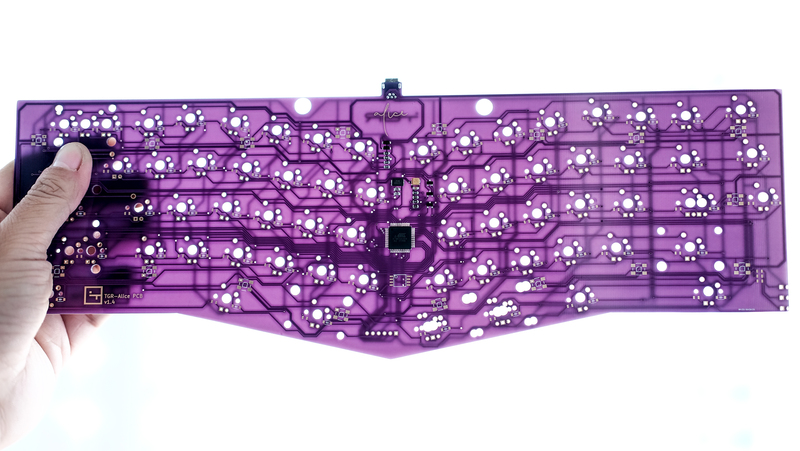 I remember seeing pics of a prototype translucent purple Alice PCB, I think. But wasn't that missing the ground plane or something? It looked cool, though. I'm not sure how much the PCB will show through with the thickness of the UHMW case, but a pretty PCB is always good if it works well. VIA is not taking requests right now, but OMG! I used it with an Aegis build I just finished, and VIA is the truth! I literally said out loud, "Uh, do I just close it?" So EASY! QMK configurator is great, too. Heck, I even really like bootloader for how easy it is. But if we can get VIA somehow for the PCB, even down the road, it's worth it. But I understand about having a bestest friend. 3) Consider hot-swap or at least capable of adding Kailh hot swap to it. For those considering Lubrigante, it is closed now. This is your option. I can agree with the first two options but I would prefer a soldered PCB. Are there arrows on the right bottom ? 3) Sorry no. Please see below. Lubrigante is closed, but if you want an acrylic case, those files are open source. For me personally, hot swap is not for this board. It’s great for testing out what you like. Tofu RGB is a well supported option at a great price. I have one and use it for that and for breaking in switches. Hot swap is great and convenient until it’s not. No, that’s the EM7. Also an amazing keyboard. I've always been a fan of wilba's PCBs. Black and copper is super clean. Although since the case is a milky white, it might be better to go white/copper. And I'm not 100% sure on the ground for that PCB but it is amazing. I'd be okay with any PCB that looked like that, any color lol. I've personally never had issues with configuring QMK but i can see the huge benefit of VIA. Definitely makes things easier. Well, honestly, with the new material, I won't know which design will need revisions until I get the prototypes in hand and have them Cerakoted and whatnot. I am really looking forward to seeing and buying this, for the PCB color, I'd say since the base color is white, white with copper traces does make the most sense or even translucent white for the RGB to diffuse better if possible. Page created in 0.123 seconds with 75 queries.